What was in the Newspapers and periodicals in 1974. Aberdeen Publican's golfer of the month. Agnes Stores dinner-dance in the Exchange Restaurant, Glasgow. Opening of the Alhambra Inn, Waterloo Street. Andros Bar, Great Western Road. Arthur Bell & Sons, tasting for the Gorbals Publicans. 1974. Opening of the Auld Hoose, Edinburgh. Beer supply in danger as dispute hits 170 pubs. Robbery at The Boghead Inn, Carmunnock. Mr. R. B. Chassels, demit office when he sold his business. The Clachan, Paisley Road West. Terry Doherty of Harp Lager. John Dunn, of Teachers whisky. 1974. 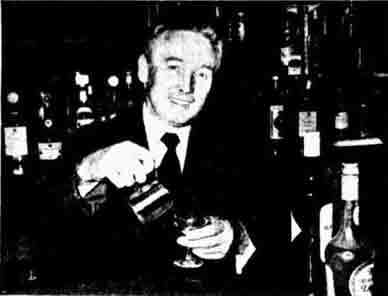 Matthew Lamont, of Peter Thomson (Perth) Ltd.
Edinburgh Licensees visit Harp Lager Brewery 1974. Edinburgh Licensed Trade Association dinner-dance 1974. Ferguson ton and lockhart, brothers. Glasgow Vintners Night Out 1974. Reopening of the Goldenhill, Duntocher. Photo of Robert T. Grier with friends. 1974. Iron Maiden, Main Street, Bellshill. Mount Vernon Hotel advert 1974. McDevitt and group of friend 1974. Muscular Arms, West George Street. Bar manager John Mitchell, of the Exchange Restaurant, Glasgow, adds cream to his winning cocktail after he took top prize in the Scottish cocktail championship in Glasgow, held in conjunction with the Bartenders Guild. John was awarded a cup and a cash prize of £15. The Open Arms, Smithycroft Road. Partick Bowlers Win Trophy 1974. 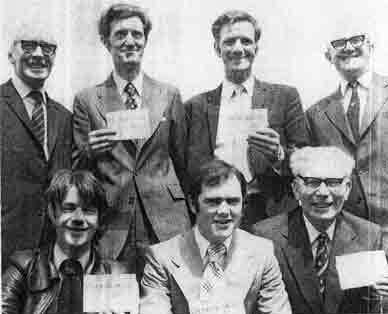 Can you name these Licensees' below in 1974. Just the ticket for the World Cup! Six members of the Licensed Trade got their hands on tickets for the World Cup finals this week, and it didn't cost them a penny. The six collected the tickets as part of a prize they won in the White Horse Cup final competition. Apart from having first-class seats for the final and the play-off for third and forth place, the winners, who will stay in a luxury hotel in Munich for four days, will sight-see in the Bavarian Alps and, if Scotland qualify for the final, attend a cocktail party with Scottish television and radio commentators on the eve of the final. The six trade winners are: Mr. S. Edgar; ?,?,?.?.?. can you name these men? Perth Licensed Trade Association 1974. Phoenix Bar, Old Rutherglen Road. Ossie Prosser's daughter gets married. Punchbowl and Sou' Wester play it out in Darts tournament. Scottish Licensed Trade Veto Defence Fund 1974. Spankies, Custom House Quay. also Panama Jax, Waves, Devils Advocate, Pier 39, Hanrahams, Bennigan's, Hasties Farm, Knightsbridge. Stella Maris Club, 69 Calton Place. 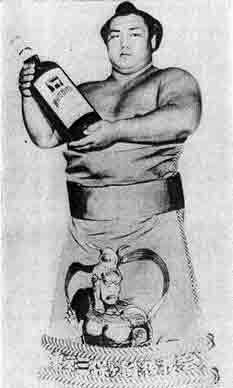 Sumo Wrestler Ozeki advertise White Horse Whisky. 1974. Opening of the Virginian, Miller Street. Young james. President of the Scottish Wine and Spirit Merchants Benevolent Institution 1974.